When I took these pictures the mood in the tournament room was lively. 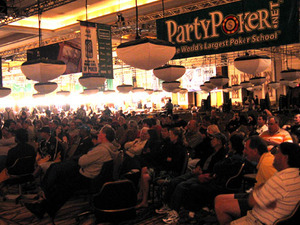 People cheering, chanting, Matusow losing $7500 in the stands playing Chinese Poker. Other pros seen playing from their leather chairs were Juanda, and Phil Hellmuth. 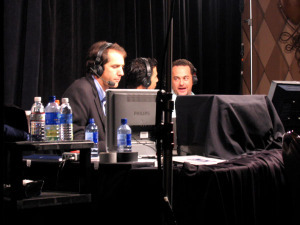 Phil Gordon had his ESPN stage in the corner of the room behind the bleachers of the final table. Pros got their make up done before taking the mic with him and finishing off with $100 Roshambo. Bracelet winners were announced throughout the night as well as the retirement of one of Harrah's longtime employees. As you've probably heard, Jamie Gold dominated the table and the evening and some questioned whether or not he made a deal with the devil. Others, myself included, discussed leaving after Allen went home fourth for $3,628,513. It was no surprise that he didn't want to take the bust out interview in the media room. Jamie Who? How about Jamie who cares. The hand everyone continues to talk about is Richard Lee's bust out Jacks. Why, Richard, why? He did take his interview, and what a class act. He has a new fan in me. Ok, how about some pics? Poker tables were replaced with chairs in the Amazon room. 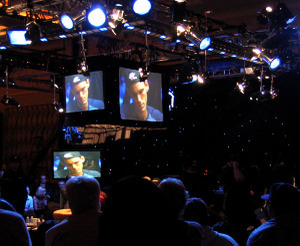 There were many sections of viewing the final table on plasmas. 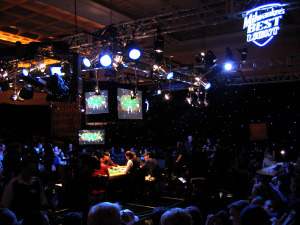 poker's first LIVE coverage of the WSOP Main Event final table. "the other guy." I can't wait to hear tomorrow's sum up of wins vs. losses. Mike Matusow took Phil for the $100 bet when his scissors beat Phil's paper. Phil to donate to the Bad Beat on Cancer fund. Heartbreak city for my favorite. I've said many times that the disfavored should use black popular culture as a "litmus test", for EVERYTHING they do is wrong and is leading them into damnation. My belief about clone hosts is the gods sold individuals on this "clone host rotation", compelling people to believe that "earing" was the way. By the time they realized their mistake it was too late. Life is a numbers game. Just as the gods use tactics to shave numbers, ensuring only an acceptable number of people from Earth are saved ("4.6%.") so will this be the case for those preditory disfavoreds who made the fateful decision and crossed the line from person to preditor. Consistant along the lines of god's preferences, expect the misled germans to have a far better chance than their Italian counterparts. These preditors from the 20th century were allowed to "get on top of it", to learn and understand, and as a result the god's will of granting Planet Earth's imperialists some benefit WILL be realized. But their plan to compensate these tools was part of their script, for they consider their use instrumental in the capacity of executing their script for Planet Earth:::History demanded evil victimizers be necessary. Blacks won't be so lucky. As recipients of these imperialist's brutality, as victims it is CRUCIAL blacks learn empathy!!! Instead they have adopted the charecteristics of those who prey upon them, and it will ultimately cost them their lives. The gods need willing candidates whom they can run through their clone hosts in corporate, entertainment, etc who will NEVER begin to learn, never get on top of things as those from the 20th century did. Due to their status as recipients, because of their willingness to turn this abuse on others, blacks will not be allowed to learn. This plays into the god's positioning nicely because they need tools who will "go the distance", taking siociety and Planet Earth down sufficiently for the gods to justify ending on Planet Earth. Much as they do now they will lie to them, tell them they will be compensated, for this is a CRUCIAL step in Earth's history, and they will need willing participants. How blacks believe is a clue:::It's "our time", "we're next", etc. The disfavored's short memory hurts us all, but it will be the end of blacks. Great Article. 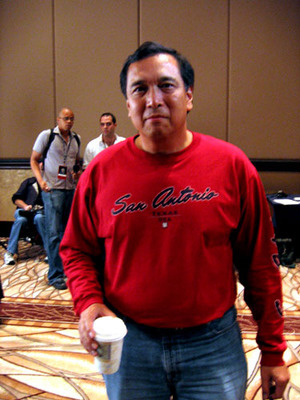 Poker Breakfast club is one of the best blogs for poker news and events. Your info is so clear and well worded. Thanks. On another note, Considering that you are all regular poker players, I can leave u a link to therakebackmafia.com- the site with best deals on rake back in the current market. They also offer a range of different services and promotions on the site, it may be well worth your while to check it out. Please do leave a comment to give me your feedback on the site and wether its a good recommendation, I'm sure you won't be dissapointed. nICE PICTURES§ That was a really nice article you posted. I like reading your posts , Thanks . 100% sign up bonus – up to £250! Copy and Paste web address to benefit from this offer. Hey Great post. Really a very nice piece of information. Newbies like me get a good idea about this… I’m going to comment now… I think i did it. Thank you..